All over the globe, in some of the world's most remote places, a new gold rush is well under way. As the price of the precious metal has grown in recent years, millions of people – modern day equivalents of the North America's famed 49ers of the 19th century - have picked up pickaxes and pans to extract it. There are now some 20 million of these artisanal and small-scale miners worldwide and they are responsible for about at least one sixth of all gold production. But they also do great environmental damage, not least because they account for the biggest single global use of mercury, the toxic metal whose production and use governments have pledged to phase down under the Minamata Convention. Their use of it to process gold accounts for a full third of its use worldwide, and frequently poisons land and pollutes the food chain. Yet, since the miners are widely dispersed – and often operating informally - in especially remote places, it is hard to control. 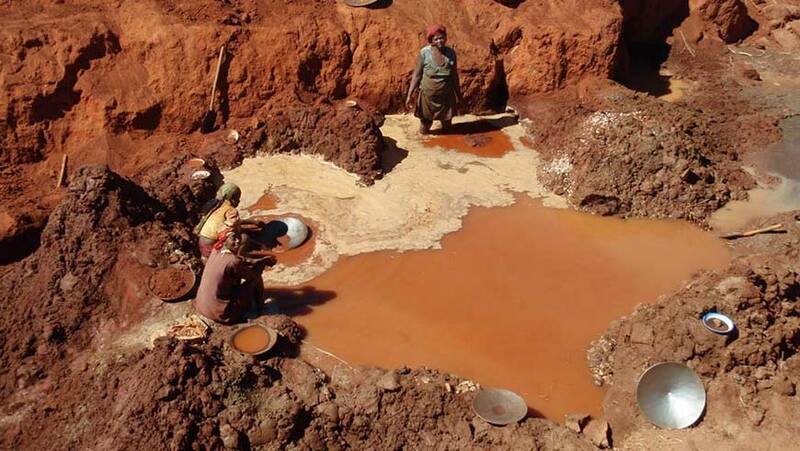 Yet using mercury is also very wasteful - achieving only about 20-30 per cent efficiency in recovery of gold, as opposed to the 60-90 per cent of alternative methods – so miners have a big financial incentive to switch, besides protecting their health. However they often do not know about the alternatives or, if they do, are unable to invest in them since it is hard for them to borrow money from conventional sources. But now a new program, financed by the Global Environment Facility (GEF) and implemented by the United Nations Environment Programme (UNEP), is both to inform miners in Colombia, Guyana, Peru, Kenya, Burkina Faso, Philippines, Indonesia and Mongolia and to design and deploy ways in which they can get loans to switch from mercury-based extraction techniques to cleaner and more efficient ones. Regulations and policies will also be strengthened and mercury-free mining communities connected to global markets and associated supply chains. The initiative – Global Opportunities for Long-term Development (GOLD) of the Artisanal and Small Scale Gold Mining Sector – is just one of 19 projects and programs approved by the GEF's council for its latest work program at its 51st meeting this week. With some $300 million provided by the GEF in funding, they will attract another $1.9 billion in co-financing. Another innovative multinational programme, also to be implemented with UNEP, is to tackle the “continuing degradation” of the coasts and shallow waters of the Mediterranean, whose southern and eastern shores are also being increasingly affected by climate change and social instability. The Mediterranean Sea Program is to attack pollution, secure freshwater supplies in critical areas, monitor trends and improve the management and financial sustainability of protected areas, in a highly innovative integrated way. A third program, this one implemented by the United Nations Development Programme (UNDP), is to be the “first national-level initiative to tackle the rather confusing national park system in China in its entirety”. Entitled China's Protected Area System Reform – and backed by the country's highest leadership – it is expected to impact the entire system, which extends over 146 million hectares of the country. Meanwhile a project implemented by the World Bank will help the Seychelles finance the protection of its seas and fisheries by supporting the issuing of some $15 million of “Blue Bonds” and once implemented by the Food and Agriculture Organization (FAO) will tackle land degradation and soil erosion in Mauritania. Further projects address such diverse issues as the use of medicinal plants in Brazil, increasing the production of renewable energy in Vanuatu, revitalizing oases in Morocco, increasing the efficiency of motors in Egyptian industry, and promoting sustainable management of the Humboldt Current System off South America, which contributes more than a tenths of the world's fish catch. In all, the work program is expected to place 29 million hectares of landscapes and seascapes under biodiversity conservation and 2.8 million hectares of production landscapes under sustainable management; move at least 6 per cent of fisheries to more sustainable levels; avoid the emission of the equivalent of 20 million tons of carbon dioxide; dispose of 3,250 tons of persistent organic pollutants; and reduce the emissions and releases of mercury by 173 tons. The 51st Council opened on an upbeat note with the GEF CEO, Naoko Ishii, launching a new book – 25 Years of the GEF – which highlights the effects of the GEF's funding told by governments, partners, agencies and convention secretariats. Noting that the GEF has a unique mandate “to safeguard the key Earth systems, which are integrated and interdependent”, she updated the Council on a recent dialogue to think through how and in what way we can catalyze system changes to safeguard the global environmental commons. Among the decisions taken at the Council, the green light was given for discussions to start on the 7th replenishment of the GEF Trust Fund. There were also decisions on a range of issues, from the Annual Portfolio Monitoring Report and the Working Group on Public Involvement to relations with the conventions, and GEF policies on gender and environmental and social safeguards. The Council received reports from the Scientific and Technical Advisory Panel and the GEF Independent Evaluation Office. Also, an update on the Capacity-building Initiative for Transparency (CBIT), which was established as part of the Paris Climate Agreement to strengthen the institutional and technical capacities of developing countries. Alongside the GEF Council, a progress report on the Least Developed Countries Fund (LDCF) and the Special Climate Change Fund (SCCF) was approved by the 21st LDCF/SCCF meeting. Belgium also announced new funding to the LDCF of EUR 24 million over three years. Closing the GEF Council, Ishii stressed the positive messages she had heard on the need to be bold and innovative, and was “re-energized” about what GEF can do for countries, people and the planet.